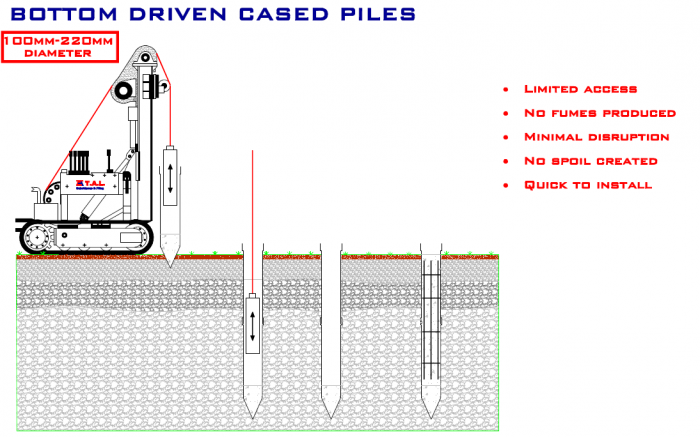 What are Bottom Driven Cased Piles? Bottom Driven cased piles are considered to be “displacement piles” (which are usually fabricated before being driven or hammered into the ground). These piles are suitable in most ground conditions and installation is quick and efficient. As the pile is driven into the ground by the drop hammer, soil is moved radially as the pile shaft enters the ground. There is generally also a degree of movement of the soil in the vertical direction. At TAL Construction, as part of our piling service, we can facilitate 100mm Driven Cased Piles. These piles can act as friction or end bearing piles depending on ground conditions. They consist of a light wall steel tube and may be driven to depths of approximately 6M. They are typically used in very light weight construction such as conservatories, single storey extensions where there is a lot of glass and are often used with boundary walls where sufficiently deep foundations are uneconomical. 150mm to 300mm Larger cased and driven Piles (Friction / End bearing). These piles are driven in the traditional fashion using a drop hammer. Where the ground conditions are suitable, these piles are particularly effective, capable of carrying heavier loads and are more or less self-testing. If you are in the public sector, a developer or a contractor, and you are considering working with us in relation to piling and specifically bottom driven cased piles, contact us in our Dublin office on 01 6310300 or in our Cork office on 021 4345999.